Southern cuckoo bumblebee (Bombus vestalis). Photo credit: Peter Gravett. 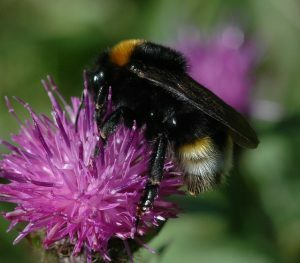 A widespread and common cuckoo bumblebee in England and Wales, the species has only recently reached Scotland and was first found in Ireland in 2014. Like all cuckoo species, they do not collect pollen for their offspring (and so have no pollen baskets or worker caste), but instead take over the nests of the Buff-tailed bumblebee (Bombus terrestris). A variable species, it has darkened wings, particularly females, and always has a yellow collar on the thorax and a white tail with a large yellow patch on each side of the abdomen, at the front of the tail. Males sometimes also have a faint yellow band at the front of the abdomen. Southern cuckoo bumblebees. Photo credits: David Palmer (left), Peter Gravett (right). The Gypsy cuckoo bumblebee (Bombus bohemicus) is very similar, but has noticeably smaller yellow side-patches. Examination of the genital capsule is useful for accurate identification of males, which can also be determined by the ratio of the 3rd and 5th antennal segments (equally long in the Gypsy cuckoo, 5th longer than 3rd in the Southern cuckoo). Females can be identified by checking the degree of pitting on the underside of the tail (6th abdominal sternite) – heavily pitted and not shining in Southern cuckoo bumblebees, smooth and shining in Gypsy cuckoos.